Juno Gemes photographic exhibition Proof  Portraits from The Movement is an important piece of history and is beautiful portraiture. The works document the lands rights movment from the 1970s and is a whos who of Aboriginal activism  Mum Shirl, Chicka Dixon, Kevin Cook, Gary Foley, Marcia Langton and others. 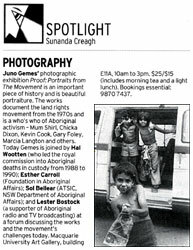 Today Gemes is joined by Hal Wootten (who led the royal commission into Aboriginal deaths in custody from 1988 to 1990); Esther Carroll (Foundation in Aboriginal Affairs); Sol Bellear (ATSIC, NSW Department of Aboriginal Affairs); and Lester Bostock (a supporter of Aboriginal radio and TV broadcasting) at a forum discussing the works and the movement's challenges today. Macquarie University Art Gallery, building E11A, 10am to 3pm. $25/$15 (includes morning tea and a light lunch). Bookings essential: 9850 7437. © Sydney Morning Herald. Reprinted with permission.